Is fuirseoir, aithriseoir, aisteoir, léiritheoir agus údar Meiriceánach é John William "Will" Ferrell. Rugadh é in Irvine, an Chalafóirn ar an 16 Iúil 1967. Tháinig cáil air as a pháirteanna i Saturday Night Live, agus níos déanaí mar réalt sna scannán grinn ina measc: Old School, Elf, Anchorman, Talladega Nights, Stranger than Fiction, Blades of Glory, Semi-Pro, Step Brothers agus The Other Guys. 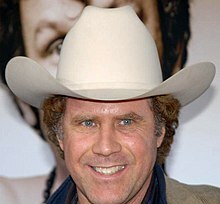 Rugadh Will Ferrell i Irvine, an Chalafóirn. Is iad Betty Kay, agus Roy Lee Ferrell Jr. a thuismitheoirí. Is as Éire, an Sasana agus an Ghearmáin a shinsir, agus is as an Charolina Thuaidh a thuismitheoiri. Patrick an t-ainm ata a dhearthair óige. Fuair a thuismitheoiri colscaradh nuair a bhí Will cúig bliana d’aois. D'fhreastal sé ar Turtle Rock Elementary, agus níos déanaí an meánscoil Rancho San Jaoqui agus University High School Irvine. Chuaigh sé ansin go Ollscoil an Charolina Theas, agus fuair sé céim sa Sport Information sa bhliain 1990. Ach, bhí fhios aige go níor mhaith leo a bheith ina chraoltóir. Theip sé i dtús ag cúpla postanna eile. Dá bhrí sin, i 1991 bhog Ferrell go Los Angeles. Anseo bhí sé ina bhall de ghrúpa coméide amaitéarach The Groundlings. Fuair sé post i gcomhlacht ceantála, agus thóg sé ard-ranganna. Tar éis cúpla bhlian i 1994, fuair sé post proifisiúnta le The Groundlings. Chuaigh Ferrell ar Saturday Night Live sa bhlian 1995. D'éirigh go maith leis mar aithriseoir ann, agus d’fhag sé anseó i 2002. Bhí Ferrell ina phríomh-aisteoir i scannáin go leor, chun cúpla a luaigh: Old School (2003), Elf(2003), Anchorman (2004), Melinda and Melinda (2004), agus Starsky and Hutch (2004). Thuill sé $40 milliún i 2005. Sa bhliain 2006, bhí an príomhról aige i Stranger than Fiction agus Tagadella Nights: The Ballad of Ricky Bobby. I 2010 bhí ról aige sa scannán The Other Guys, in éineacht Mark Wahlberg, agus rinne sé an ghlór Megamind sa scannán Megamind. I 2013, bhí páirt aige i Mediocre American Man Trilogy le Anchorman 2: The Legend Continues. I mí Lúnasa 2000, phós Ferrell an ban-aisteoir Viveca Paulin. Tá sé ina gcónaí i gcathair Nua-Eabhrac, agus i gContae Orange i gCalifornia. Tá triúir páistí acu. Rugadh Magnis Paulin Ferrel i mí Márta 2004. Rugadh a dhearthair Mattias i mí na Nollag 2006, agus Axel i mí Eanáir, 2010. ↑ "Sinigh iad! Caitheann an fhoireann Anchorman geansaí sacar Éireannach ar an Late Late Showí (An alt ata as béarla)". The Score.ie. ↑ "NUACHT I NGEARR: Cuireadh bainis Lynch ar athlá (An alt ata as béarla)". People Magazine. ↑ "Fáiltíonn Will Ferrell is a chéile, Viveca, roimh dá mhac nua (An alt atá as béarla)". People Magazine (2ú Eanair, 2007). ↑ "Fáiltíonn Will Ferrel roimh a thríú mhac (An alt atá as béarla)". People Magazine. Tugadh an leathanach seo cothrom le dáta an 23 Feabhra 2019 ag 03:56.